Bone broth has been used for thousands of years in Ayurvedic medicine and for great reason. This traditional remedy contains a powerhouse of easy-to-absorb nutrients along with a long list of health benefits. 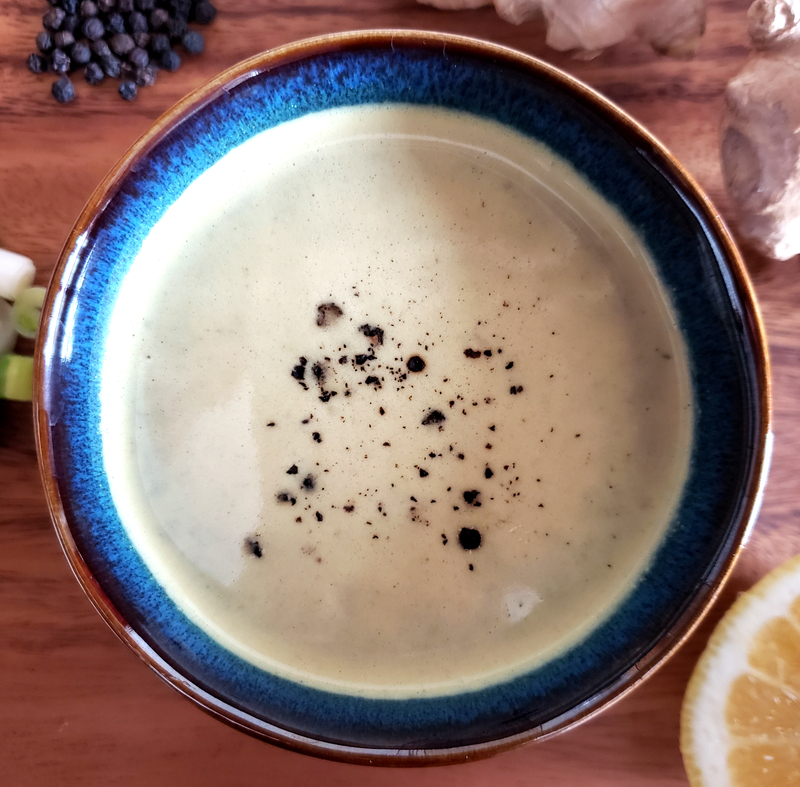 According to Ayurveda, bone broth is an energizing, nourishing, Ojas-increasing tonic that is great during times of low immunity, illness, depletion, malabsorption, Vata imbalance, post-cleansing, pregnancy and postpartum. Of course with its wide variety of healing properties, bone broth is an excellent daily remedy to simply maintain health and promote optimal wellness. The tahini added in this recipe makes it even more nutrient dense while adding in an amazing flavor and decadent creaminess that will keep you coming back for more! Ojas is the vital force in the system that governs over our immunity, vitality, energy and libido. It is that juicy quality that makes an individual glow. Having healthy Ojas is essential for our overall health and wellbeing. One of the best ways to promote robust Ojas in the body is through our diet, making this recipe a healthy, nourishing addition to your snack or meal routine. Discover more ways to increase healthy Ojas here! In my opinion, tahini is a kitchen essential that is often overlooked and underused. As a main ingredient in this bone broth recipe it not only improves the texture and flavor of the broth, but provides us with even more health benefits. Tahini (and sesame seeds) is a dietary staple for female health, as it supports women through all stages of life including menstruation, menopausal transition, pregnancy, postpartum and breast feeding. It is naturally rich in B vitamins, protein, fiber, zinc, magnesium, calcium and copper making it a great tonic for the skin, hair, bones and muscles alike. 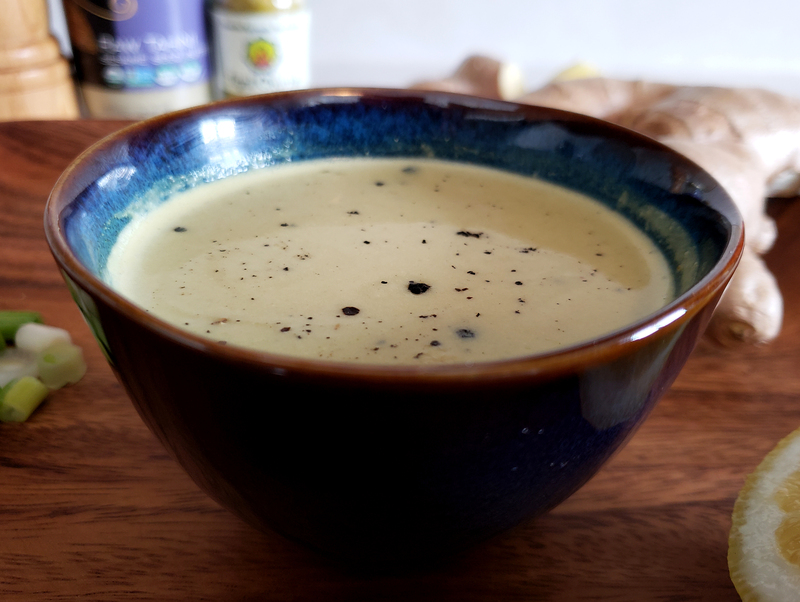 Although tahini is a powerhouse of nutrients, the bone broth contains a long list of health benefits all on its own. From strengthening the bones, relieving arthritis and lubricating the joints, bone broth naturally is a effective remedy for supporting bone health at all ages. It is also well known for its ability to boost the immune system, enhance energy and calm the nervous system. 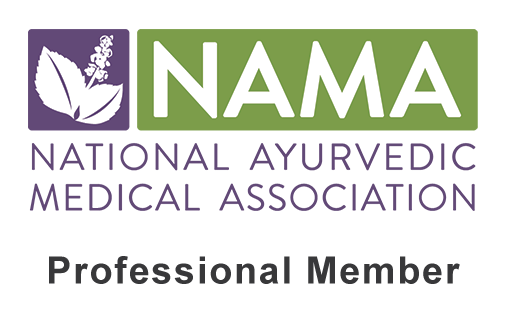 It is an essential when treating leaky gut or any type of inflammation in the GI tract, as it is very effective in soothing the irritated membrane. *Please see the Optional Doshic Variations below to make this recipe more suitable for Pitta and Kapha types. 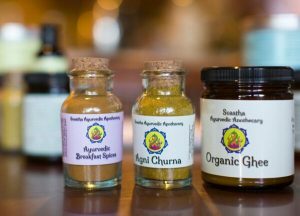 *Agni Churna can be replaced by 1 tsp each of powdered turmeric, fennel, coriander, brown mustard seed and cumin. **I would recommend to begin with a small amount of these ingredients and add in more after tasting only if needed – a little will go a long way! 1. Place 12 cups of water a crock pot. 2. Add in the chicken meat and freshly grated ginger. Set the pot to a low setting for 12-16 hours. 3. After the allotted time, strain out the meat and ginger using a mesh strainer and pour the broth into a large gallon size pot. NOTE: The leftover meat can be added to many dishes such as chicken pot pie, rice and beans or chicken noodle soup (remove the ginger first). If you do not wish to eat the chicken, your dog will likely enjoy it. Of course make sure to remove any bones first! 4. Add in the Agni Churna, tahini, lemon juice, salt, freshly ground pepper and cayenne pepper. Using the hand blender, blend the ingredients evenly together until a creamy liquid forms. NOTE: If a regular blender is being used, add a portion of the broth along with all the listed ingredients in #4 and blend on a low setting until evenly blended. Add the creamy, blended broth to the remaining broth in the stock pot and stir well until they blend together completely. 5. Your creamy broth is now ready to enjoy! You can serve it up in small bowls or mugs and garnish each serving with a small handful of green onion. 6. Sip on this creamy broth and enjoy it as a snack, appetizer or side dish. Alternatively it can be used as a base or tasty addition in any recipe you desire. 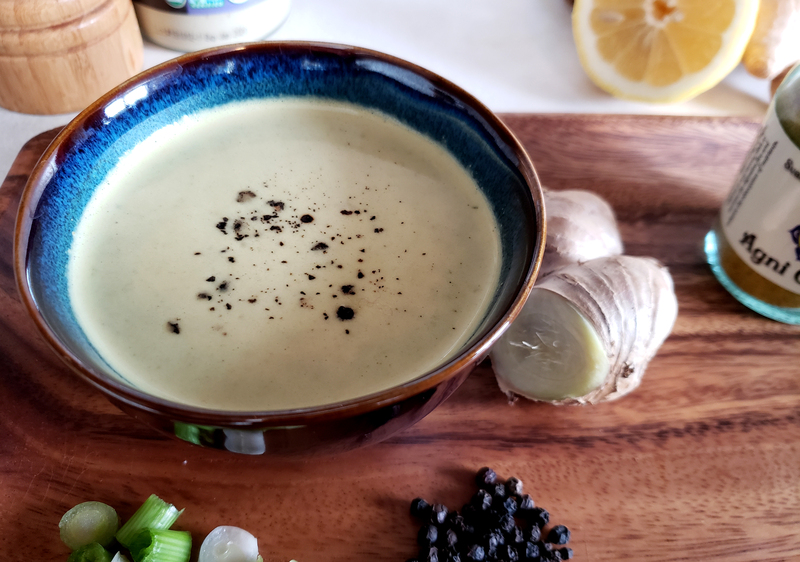 However you decide to enjoy this broth, it is recommended to drink about 1 cup per day to get continuous nourishment and noticeable health benefits from this traditional remedy. NOTE: I personally drink a warm mug of this broth between meals as a deliciously satiating snack; however, it is also a great addition to many recipes! Try pouring some over steamed veggies to make them more exciting, or over quinoa to increase the protein content and make the broth a bit heartier. It can be used as a base for soups or kitchari to create a creamy texture and enhance the flavor and nutrient content! *This broth can be refrigerated and stored in an airtight glass jar or tupperware container for up to 5-6 days. This recipe is an excellent tonic for pacifying Vata due to its warm, creamy nature. It is high in nutrients that are easy to digest and absorb. It is overall heating, anabolic (building) and very nourishing. No changes need to be made, although Vata Churna can replace the Agni Churna to make it even more Vata-reducing. This particular broth recipe can be a bit too warming for Pitta types. Therefore it is best enjoyed during the cooler seasons to avoid provoking excessive heat in the system. If it is still too heating for your Pitta, one should use white meat chicken (still with bone in) rather than dark meat, reduce the tahini to 1/2 cup, replace the lemon juice with fresh lime juice and replace the Agni Churna with Pitta Churna. The cayenne pepper should be omitted and the salt should be used sparingly. This recipe can be a bit too creamy and oily for Kapha types, although they can still enjoy it with the proper modifications. If you are experiencing high Kapha one should use white meat chicken (still with bone in) rather than dark meat. The tahini should be cut in half and the amount of fresh ginger can be doubled. 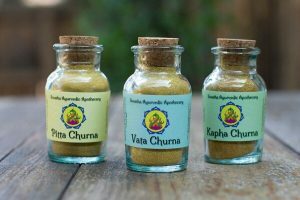 The spices should all be used generously and the Agni Churna can be replaced with Kapha Churna. Pink Himalayan salt is the best salt option for Kapha; however, this should still be used sparingly.